2004 has been our busiest field season yet; with two excavations, three more of our series of very large, whole Roman fort geophysical surveys and a continuation of our air photographic program. As always, our work attracted volunteers from a wide geographical area, with diggers from Canada and the USA taking part alongside those from the UK. Another three week season was conducted on this well preserved Roman Iron Age settlement and it continued to yield fascinating and often unexpected data. We already knew from previous seasons that we had a complex series of superimposed structures stretching over at least a thousand years, but the 2004 dig produced yet more structural complexity. The excavation centres around a large, c. 13m diameter, roundhouse which sits inside a substantial ring ditch. We already had glass and a C14 date which showed that it was occupied around the time of the 1st century Gask frontier and burned down, probably in the third century. It thus spanned the time of Roman involvement in Scotland and so formed an excellent resource for studying Roman/native interaction. We also knew that it had been rebuilt at least once, suggesting a lengthy occupation. The 2004 season was largely dedicated to studying the floor levels of this house and revealed signs of a still longer period of use. Traces of a later floor than so far encountered had survived the plough towards the eastern side of the site and this was accompanied by late third to fourth century glass beads and a fragment of fourth century Roman vessel glass. The latter was particularly interesting as it showed that the site continued to have access to Roman material culture long after any military involvement in the area had ended. This is not the first such evidence that the Project has uncovered, for Roman pottery of much the same date was found some years ago on what appears to be a native site adjoining the Gask tower of Peel, and it will be interesting to see if other sites produce similar evidence in future. Beneath this late floor lay parts of another, which had been heavily burnt and produced Roman Samian pottery of mid second century, Antonine date. It too was badly plough damaged, but the date would fit with that of the house whose carbon dated destruction by fire has already been mentioned. Fig 1. East Coldoch main roundhouse, showing paved area. The excavation was able to study the burnt floor over a much wider area and there are emerging signs that it may have been subdivided into areas of differing function. The house entrance faced east and to its north a substantial area of paving was revealed. 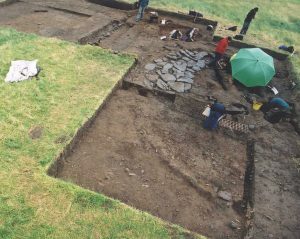 A small part of this was found in the 2000 season and interpreted as make up, to level the floor on what would otherwise have been a slight slope to the north. Certainly it was not used directly as a floor. It was too uneven and showed no sign of wear. Instead, it was coated with a skin of clay which had acted as the true floor surface. This year’s work, however, showed that the stones were less extensive than might have been expected for levelling, and covered only about 70o of the house’s circumference, rather than the 180o that lie on the slope. Instead, it is tempting to wonder whether it might mark an area whose use demanded particular strength, for example stabling or stock accommodation. Further west, a radial line of stake holes was found in 2003, which might delineate another specialist room or area, and this year’s work found evidence for metal working concentrated in a similarly sized sector to the south of the entrance. The C14 dated building was known to have been the second phase of the house to have burned down and that fire had been thought to be the end of the structure, until the discovery of the third/fourth century floor this year. Equally, the first house to burn was thought to be the building’s earliest incarnation, but this too now seems not to be the case. Two small sondages were cut through what had been thought to be the primary floor, just to confirm its nature and to look at any levelling deposits. Instead, they found a complex of layers which probably represent another two phases, one of which might represent a so called “ring ditch house” floor. This leaves us with further issues to sort out and, although 2004 had been planned as the final season, another will be needed in 2005. The site has developed quite a tradition of springing a major surprise on us at a time too late in the dig for anything much to be done about it, and this year was well up to standard. The lower levels of the less well preserved eastern side of the house had produced a complex series of inter-cutting pits, few of which seemed to be structural. Their sequence was sorted out without undue difficulty, although some of their functions remain unclear. The final day, however, saw the excavation of the two earliest, and both produced human remains in the form of teeth and skull fragments. The site has already produced evidence for much earlier funerary activity, but these pits do not appear to fit with this. Firstly, the remains were in simple dug pits and not in the stone cists found elsewhere and, secondly, they seem too closely associated with the house. For one of the pits was located almost exactly under its centre point, whilst the second lay in the entrance. This raises the possibility that both may be that most chimerical (and probably over claimed) of archaeological phenomena: a ritual deposit, perhaps associated with the house’s original foundation. Certainly, they are not ordinary burials. The entrance pit, at least, was only large enough for the head found and not for a whole body. Moreover, the skull fragments were found with a single vertebra and, as this was presumably still attached when the head was buried, it must surely have been still fleshed and thus fairly newly severed. This does, of course, raise all sorts of bloodthirsty possibilities but, in fact, there is no way of telling whether the head was removed post or ante-mortem and the remains are so poorly preserved that we are unlikely to be able to determine a cause of death. To the north of the main house, a new area was opened to further investigate a series of ephemeral later features found in 2003, which may have had a funerary function. A few more faint traces were revealed, but these had been largely masked by a long, linear, stone packed cut. This produced something of a stratigraphic riddle. It closely resembled an old fashioned stone filled field drain, but it did not continue across the backfilled remains of the roundhouse ring ditch. At first sight this seemed to suggest that it had been cut by the ditch and thus predated it, but an examination of previous seasons’ records has shown that it did not resume on the ditch’s far side. It also seems to cut the later funerary features and it seems that the ditch may have been used as a sump for a field drain built to run into it at a time in the early modern era, when it was still partly open. As in previous seasons, the preservation of organic materials was superb, with grain and hazel nut shells again being particularly abundant. Most of the grain was barley, but our macrofossil expert, Jacqui Huntley (University of Durham), has again confirmed our field impression that wheat and oats were also present. Wheat is common on Roman installations, but rare on Iron Age sites, especially as we are now told that the site has produced bread wheat as well as the more normal spelt and emmer. This could be a hint that local people changed their agricultural practices to provide the occupying army with supplies, but there is a problem here because Jacqui also tells us that there are few signs that the grain was processed on site (apart from a small amount of chaff in the ditch silts). Indeed, the entire cereal corpus currently presents something of a mystery. For our pollen expert, Dr Susan Ramsay (University of Glasgow) has only been able to find a single barley pollen grain from the entire site (and none of wheat and oats), despite our asking her to make an intensive search of the many samples taken. This would suggest that the cereals were not being grown on or near the site. The unusually large roundhouse would certainly suggest high status occupants and it may well be that they were able to trade for, tax or otherwise command bulk produce grown by others. If so, however, the presence of wheat raises an interesting possibility, for it might suggest not that the inhabitants were growing food for the Romans, but that they were actually adopting Roman tastes. The fact that we had already found fragments of Roman bottle glass certainly suggested that the house was no stranger to Roman wine (or perhaps condiments), but the adoption of Mediterranean drinking patterns is quite common in native societies all round the imperial fringe. Eating habits are often thought to have been much more conservative, however, so this may be a particularly interesting hint. Moreover, the 2004 season found seeds that we suspect may be grape pips, although this still awaits expert confirmation. Fresh grapes are unlikely to have been available this far north in Britain, given the local climate and the slowness of ancient transport, and this leaves two possible alternatives. One is that the pips came from Roman wine. Ancient wines seem to have come with a good deal more sediment than we would expect to find today, so much so that sieves were a standard part of Roman drinking equipment. Another possibility, however, is that the pips came from imported raisins and, if so, this may be another example of a taste on site for Roman foodstuffs to go with their taste for Roman beads, glass and pottery. Just to the south of the well known library and chapel at Innerpeffray, a substantial (and obviously artificial) cutting runsup a steep wooded slope from the east bank of the Earn. Fig 2. Plan of the Innerpeffray excavation. Quite plausibly, local lore has always had it that this was the Roman Gask road coming up from its crossing of the river. There is an old ford at this point and aerial photography has shown what seems to be the Roman road from the nearby fort of Strageath approaching its opposite side. Likewise, there is a bend in the upper (eastern) end of the cutting which turns it onto the line of the next known length of the Gask road, around 900m further East, approaching and crossing Parkneuk Wood on the Gask Ridge proper. Nevertheless, no archaeological work had ever taken place to check. This seemed a great pity, for the cutting is a major engineering achievement. Ironically, the wood is so dense that it is possible to get within a few meters of the cutting without seeing it, but it is around 130m long and up to 3.5m deep as a surface feature. Almost 2,000 cubic meters of soil have been removed in its construction and walking up it in winter, when the trees have lost their leaves, can be awe inspiring. Consequently, when Perth & Kinross Heritage Trust offered to fund a training dig here for Perth Archaeology Week, we jumped at the opportunity. The results were even better than we had hoped. The excavation revealed a metalled roadway under a full 1m of overburden, which meant that the cutting was originally up to 4.5m (15′) deep. The road itself was very badly worn, suggesting a long use, and had well preserved wheel ruts 1.57m (5′ 1″) apart, which is just slightly larger than the modern standard railway gauge. The cutting itself ran through sand which would normally have made it vulnerable to weathering and collapse. To counteract this, it had been thoroughly revetted with a thick layer of puddled clay that also passed under the road bed. No Roman datable material was found, but the road did yield Medieval as well as 18th century pottery. This would suggest that the cutting was already in existence in the Middle Ages and, as this is not an era known for its well engineered road projects (bridge building excepted), a Roman date for the feature seems all but certain. Interestingly, the road was only 2.8m wide in the cutting, which is markedly narrower than any of the known Gask road stretches: which range from 5.8m to 7.9m (19′-26′) in width. There are, however, quite a number of similar cuttings that have been proved to be Roman and where a comparable narrowing of the road has been found. The best known examples are found in and around the Alpine passes in Switzerland and these are often similar in width. The narrowing is presumably a labour saving measure to allow heavy traffic to move up and down a more gentle gradient, albeit only in one direction at a time, without the need to excavate the full width of a two carriageway road. If so, the saving would have been considerable. For had the Innerpeffray cutting been dug to the full average width of the Gask road (c. 6.8m), more than 1,000 cubic meters of extra earth would have needed to be moved: a 54% increase in an already considerable workload. For the last few years the Project has been conducting a series of very large geophysical surveys, taking in entire Roman forts and their surroundings, and we are eventually hoping to survey most of the forts north of the Forth-Clyde line. This year we were able to survey two more known forts along with a third suspected example. Drumquhassle. The Roman fort of Drumquhassle lies within sight of Loch Lomond, near Drymen, and is (so far) the southernmost of the line of so called “Glen blocker” forts which stretch as far as the Tay. It was found from the air in the late 1970s, but has never shown very well and, apart from a couple of exploratory tranches dug to confirm its suspected 1st century date, little excavation has taken place. As a result significant parts of its defences have never been traced and we really know very little about it. Our own work consisted of a 17 acre resistivity survey and an almost equal sized magnetometer survey. We have traditionally done our resistivity work with a Geoscan meter taking readings at 1m intervals with a 50cm electrode separation. 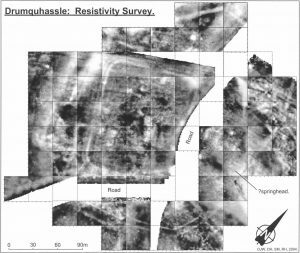 Fig 4 The Drumquhassle resistivity survey. This allows a lot of ground to be covered relatively quickly, but higher resolutions are possible and greater electrode separation allows a survey to look to greater depth. As an experiment, therefore, the fort itself was covered by a second meter fitted with a multiplexer which allowed one 1m and two 50cm electrode separation readings to be taken simultaneously, with the readings taken at 50cm intervals to give true 50cm resolution. The results were noticeably clearer and do seem to justify the considerable extra work involved. The magnetometry was done with a Geoscan FM256 fluxgate gradiometer, with readings again at 50cm intervals, but we also surveyed a substantial (2 acre) section of the fort with a magnetic susceptibility meter. This was done largely as an experiment. Magnetic susceptibility is usually used at extremely coarse resolutions, that can be up to tens of meters. Fig 5 The Drumquhassle magnetic susceptibility survey superimposed on the resistivity plot. It looks only at the topsoil and was thought to be of little use except for identifying possible areas of settlement by detecting burnt material being ploughed up from buried sites. Instead, we used it at half meter intervals and it was able to detect the fort ditches and, more importantly, two possible native ring features outside the fort which were not picked up by the other techniques. The fort was shown to have a double ditch with the characteristic 1st century “Parrot Beak” entrance breaks, in which the outer ditch turns inwards to join the inner on either side of each gate. 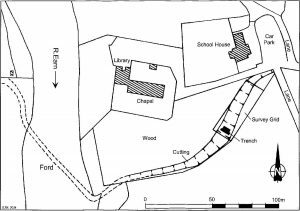 The fort measured approximately 111m (e-w) x 133m (n-s) over the inner ditch which equates to an area of c. 1.47ha (3.6 acres). The ramparts were not clearly detectable, but the fort’s internal area was probably in the region of 2.6 acres, which would make it substantially smaller than some of the other Flavian forts to the north of the Forth and Clyde, albeit still much larger than the large (>1 acre) fortlets of Cargill and Inverquharity which we surveyed in 2002 and 3. Air photographs of the site show a series of ditches to the north and south which have been interpreted as one or more annexes. The survey was able to follow one of these ditches for a further 210m, right past the fort’s eastern side, but no trace was found to the west. Instead, there were signs that the southern ditches might join the fort’s southern outer ditch. Nevertheless, these ditches enclose an unusually large area and their morphology is unlike that of any other known fort annex. They have distinctly angular corners and parts of the northern area seem to vary between single and double ditched form, neither of which are normal Roman characteristics. It is, thus, worth wondering whether they might be post-Roman in date, albeit they might have made use of an existing Roman fortification. 50m to the east of the fort, faint traces of a rectangular enclosure were found attached to the supposed annex ditch. This surrounds a copious spring which is much the closest water source to the site and which , we are told, never fails, even in the driest of summers. The enclosure was roughly (20m)2 and, although at present there is no evidence to confirm a Roman date, it could represent a springhead structure of some sort. Our previous fort surveys have consistently detected greater than expected concentrations of ring features around Roman forts, at least some of which may have been native roundhouses occupied during the Roman period. Air photographs have already revealed substantial Iron Age occupation in the field to the north of Drumquhassle but, as the entire area has since been destroyed by quarrying, it could not be surveyed. The 2004 work did, however pick up several circular features closer in, to the west of the fort, which had not been seen from the air and at least four of these also seem likely to be roundhouses. We commented last year that some of the native features detected by our Cargill survey contradicted the accepted wisdom that Iron Age roundhouses always have their entrances oriented towards the east, perhaps for ritual purposes and/or to face away from the prevailing westerly wind. The Drumquhassle survey revealed a similar maverick, for the largest ring feature detected (which has a diameter of almost 20m) had its entrance facing firmly towards the southwest. A number of artefacts were picked up from molehills inside the fort’s southeast quadrant, including sling bullets, similar to a series found some years ago in the same part of the site. An enamelled Roman broach was also recovered and is currently being analysed. Fendoch. Fendoch Roman fort sits on a distinct, flat topped hill near the mouth of the Sma Glen (northeast of Crieff) and, like Drumquhassle, it is part of the so called “Glenblocker” line along the Highland fringe. It has been known since the early 20th century and the late Prof I.A. Richmond conducted excavations in the interior in the 1930’s which allowed him to present a complete, albeit somewhat conjectural, plan. Richmond made little attempt to study the ditch system, however, and all but ignored the fort’s surroundings. 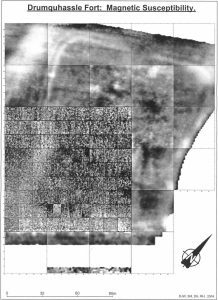 Our own work followed the pattern set at Drumquhassle, with the fort covered at 50cm resolution with resistivity and magnetometry and with a large area outside covered by resistivity at 1m resolution. An attempt was made to repeat the magnetic susceptibility experiment, but equipment problems forced its abandonment. In all, this was our largest resistivity survey to date, with a total of 20 acres being covered. The results revealed a clear image of the fort’s defences which again had a double ditch with so called “Parrot Beak” entrances at each of the four gates. The defences measured 187m (e-w) x 109m (n-s) over the inner ditch: an area of c. 2.03ha (5 acres). 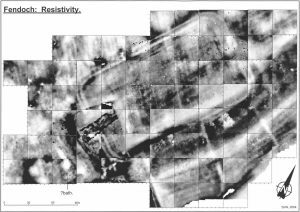 Fig 6 The Fendoch resistivity survey. This matches reasonably well with Richmond’s excavation evidence for dimensions of 100m x 182m over the rampart: an area of 1.82ha (4.5 acres). One minor mismatch with Richmond was detected, however. The excavation measured an unusual narrowing of the fort’s short axis towards the west, amounting to a quite substantial 5.5m. The survey did reveal a very slight parallel narrowing in the ditch system, but this was a good deal smaller at just 2m. The excavation raised the possibility of an annex attached to the western end of the fort’s southern side, but made no detailed study. The geophysical data showed the feature clearly, although its southwest corner had been eroded by the nearby Fendoch Burn. The feature had a single ditch with an entrance in its eastern side. Its original measurements were probably c. 81m (e-w) x 86m (n-s), giving an area of approximately 0.69ha (1.7 acres). The fort defences may be reduced to a single ditch over the length covered by this annex, but land slippage and unusually severe rabbit damage make it difficult to be certain, especially as the soil resistance went beyond the working range of the meters in places. An 11m diameter ring ditch was found inside the annex, which may represent a native roundhouse. If so, it produced very high negative magnetometry readings, which would suggest that it burnt down. Unlike all of the other forts surveyed, however, no concentration of native features was found outside the site. To the east of the annex, a second, single ditched rectilinear feature was found. This was also attached to the fort ditch system and may also connect to the annex ditch, although that could not be proven. It was rather less regular in form but measured, on average, 73m (e-w) x 79m (n-s) giving an area of approximately 1.4 acres. Fig 7. 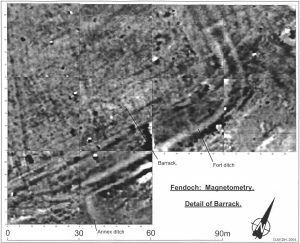 Barrack block showing on the Fendoch magnetometer survey. This may be a second annex, or the two might represent the result of a single enclosure being expanded or contracted. Its southeast corner is, however, rather angular and the feature may not be Roman at all. Only excavation will tell but, whatever the case, both fort ditches continue across its northern front. Inside the fort, we had not really hoped to compete with the information already supplied by the excavation. The magnetometry did, however, produce an image of a complete barrack block near the southeast corner. This is a useful control on Richmond’s plan of the same structure, which merely extrapolates from a small number of slit trenches. The block shows in considerable detail with individual room partitions being visible, but quite why this building was brought out so clearly when none of the others show at all remains a mystery. 45m to the fort’s southwest, a very high resistance feature was detected in an area of lower lying, damp (low resistance) ground, which probably hides a spring. This consisted of a square anomaly attached to an oval or apsidal structure which, together, measured c. 16m (e-w) x 27m (n-s). The high readings suggest stonework and although, as yet, there is no conclusive proof that the feature is Roman (or even man made), the size and form mean that the possibility of a bath building seems at least worth raising. If so, this would be a major discovery for, although a bath block is known at the legionary fortress of Inchtuthil, no other extramural bath has yet been found amongst the 1st century forts to the north of the Forth and Clyde. Newton. Archaeologists have long sought in vain for a Roman fort in Fife. Two temporary camps are known with certainty and there is a third probable site at Bonneytown but, at present, not a single permanent installation is known. Last year we reported on finding a promising candidate from the air at Newton near Collessie. This lay in a strategically important position and seemed to be the right size and shape. 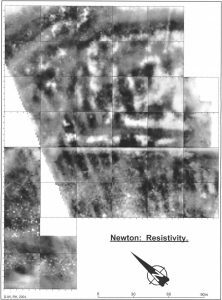 Fig 8 The Newton resistivity survey. You can’t win them all, however, and a third large (9 acre) resistivity survey has now shown that, although there is undoubtedly a large subrectangular enclosure of some sort present, its shape is such that it is most unlikely to be Roman. It sits amongst Medieval rigg and furrow, but lies on a different alignment and its date will only be determined by excavation. Given a fairly damp summer, we had expected the 2004 cropmark season to be something of a washout, but a dry spring had left its mark and the result was something of a curate’s egg. Some areas were every bit as bad as feared, with “old faithful” sites not showing at all, but others were better than we had ever seen them and, despite difficult weather conditions, we were able to make a number of productive flights. Nevertheless, we still had a little of our budget left at the end of the year and so were also able to exploit a period of low December sun to look for shadow features in the highland glens. In all, we made five flights (totalling 15 hours) and took around 1,800 photographs. As ever, new discoveries were made, including a number of what appear to be Iron Age settlements. One of the more interesting finds was a large ring feature beside the Roman Gask tower of Peel. Some years ago sherds of late Roman pottery were picked up on this spot by Mr W. McIntosh, a local gamekeeper who regularly sends us finds made in the course of his work, and our own resistivity survey of the tower detected part of a second ditch that intersected the Roman defences. We thus already suspected that there should be a native site here, possibly one that reused the Roman ditch and, like East Coldoch, still had access to Roman imports long after the army had departed. The new aerial discovery may well be that site and it would be interesting to carry out further work here in future. The winter flight saw absolutely perfect conditions, with bright, low angled sunshine and high shadow contrast, thanks to a widespread dusting of frost. The prime aim was to look for Iron Age sites. Much of the assumed rationale for the Roman “Glen blocker” forts is a need to defend the occupied lowlands against attacks down the glens. Yet, previous work, including flying by ourselves and others, has revealed remarkably little trace of native occupation in this part of the Highlands at that time. The aim was to search for new sites but, although a small number of promising candidates were detected, there is still little sign of more than a sparse population. What did appear, though, were the remains of numerous early modern sites, most of which were probably abandoned during the highland clearances. Some these were already well known, but others do not seem to have been mapped before. As in previous years, our flights were made from Scone, and we are again immensely grateful to Bill Fuller for volunteering his services as pilot. Bill retired as an airline captain this summer and we wish him all the very best for the future. Hopefully, our working partnership will continue for a long time to come and, to judge from the way we didn’t bang into any scenery despite some fairly impressive manoeuvring in the glens this winter, he has certainly not forgotten how to do it. In addition to our own pictures, local flying instructor Sandy Torrance has again been kind enough to send photographs taken during his flights, which give us vital coverage at different times of year. As before, these provided valuable information on flood patterns around the rivers of our study area, which helps us to predict ancient settlement areas. They also contained their fair share of archaeological discoveries, including what seems to be a second enclosure at Newton. The most important, however, is the first truly convincing evidence we have seen that the Gask frontier road might continue north of the Tay. There are antiquarian reports of such a road, mostly written in the 18th century, and a short stretch of road is known in Caldhame Wood (Kirriemuir), which local lore believes to be Roman. There is, however, no firm evidence. The Ordnance Survey shows a purely hypothetical line heading from the east bank of the Tay, opposite the Roman fort of Bertha, and heading towards the northeast. Fig 9 Possible Roman road line north of the Tay (photo A.S.Torrance). Sandy’s photographs, however, show a clear road track running a little to the west of the OS line. This heads straight as an arrow towards the temporary camp of Grassy Walls and seems to bear no relationship whatever to the modern field system, which suggests that it might be very old indeed. 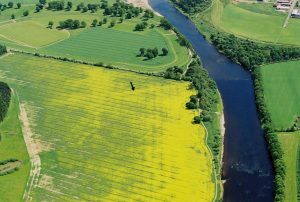 Sandy also provided soilmark photographs of the fortlet at Cargill: further north, beside the Tay Isla confluence. These too show a long straight linear feature which might be a section of the same road and it will be interesting to see if further stretches emerge in future seasons so that we can begin to form a coherent picture. During the year, we have also managed to catalogue all of the bumper harvest of pictures taken in 2003. In all, some 2064 photographs were analysed, digitised and catalogued, and CD-R sets have been distributed to the Project’s members and sponsors, and to other interested bodies. One of the myths of aerial archaeology is that we fly around making discoveries. Technically, this may be true, but we often don’t realise that we have made a discovery until the cataloguing stage when each site is located and checked with the National Monuments Record of Scotland (NMRS). Now that this process is complete, we have a final total of 55 new sites found last year, ranging from indeterminate cropmarks to a full blown hillfort and we also added extra details at quite a number of known sites. It has to be said that the site identification process has got a lot easier of late thanks to the RCAHMS’ wonderful new Internet based Canmap service. The Commission has long been impressively forward looking in putting information online and the NMRS has been available in text based form for years via a system called “Canmore”. The new service is map based, however, and so faster and very much more intuitive to use and we cannot praise it too highly. With a little help from our long standing private sector sponsor, we have also been able to replace the cameras we use in the air. Since our flying program began, we have been using the same 1980s Olympus OM cameras that we use for excavation photography. These are still superb machines, which we will continue to use on the ground, but they suffer from one major defect in the air in that they have no shutter speed priority automatic exposure mode. The high vibration environment of a moving light aircraft makes the use of very fast shutter speeds imperative if sharp images are to be obtained and the result has been that we have been forced to spend more time than we would like watching the camera light meters and fiddling with aperture settings, rather than constantly watching the ground to get the best pictures. Fortunately we have now been allowed to buy new equipment. The choice was surprisingly difficult. We initially took a long hard look at the digital market, since that seems to be where everyone else is going but, although the Project does now have a high quality digital camera, we remain unconvinced that the image quality is yet good enough or that digital files will last long enough to be safe for use in primary archaeological recording. We will thus buck the trend for the time being and stick firmly with film. There is, though, one real advantage to the “digital revolution”, for we find that truly top flight film cameras are now available second hand at distinctly bargain basement prices. As a result we now find ourselves the proud owners of a Leica R4 SLR and motor drive for the price of a digital compact. We have also long felt somewhat ashamed to be using only 35mm cameras in the air, rather than the much higher resolution medium format so, in addition, we have now obtained a Pentax 67II SLR which, as the name suggests, takes 6 x 7cm negatives. The new cameras were first used in anger on our winter flight and the gains in quality and exposure consistency seem to fully repay the investment. Collaborations. The Gask Project has again been able to work with a number of other scholars to gain additional information from our own sites and those of others. Some of these have already been mentioned, but we have also worked with lithic specialist Abi Finnegan, pottery expert Felicity Wild and numismatist, David Shotter. As in previous years, gamekeeper, Mr W. McIntosh, very kindly sent us material, including more finds from around the temporary camp of Forteviot and Mr Bill Kerr provided metal detecting and field walking finds. The two fort surveys were collaborations between the Project and Mr David Hodgson, a postgraduate student of Geophysics at the University of Bradford. David has worked with us as a volunteer on several of our past surveys, but this year brought the possibility of further mutual benefits. David has been investigating the effects of different geology on geophysical results and, in particular, the effects of the Highland Boundary Fault. Our two forts were thus ideal test beds for his research and will hopefully produce yet more data to add to their purely archaeological value. Archive Work. Since its foundation, the Project has been involved in tracing and publishing earlier work, whose instigators were unable to publish their results themselves. This year we have managed to trace the records of a 1960s excavation on the Caldhame Wood road, already mentioned, and are currently preparing a report. 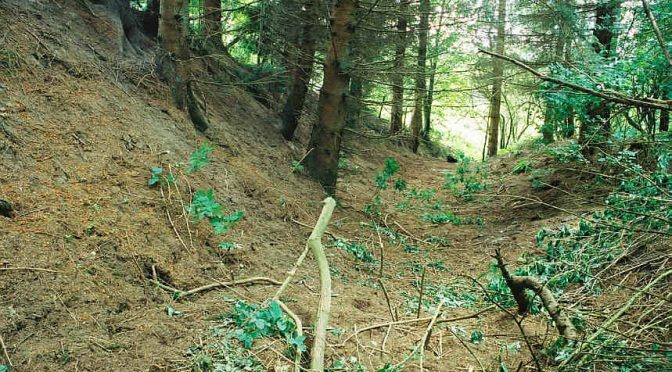 Birgitta has also been able to make good use of the Perth archives to shed light on the later history and eventual abandonment of the Innerpeffray cutting, as well as tracing material on a number of Roman road candidates north of the Tay. Publications and Publicity. As always, 2004 has seen a number of Gask Project publications. Birgitta had a paper analysing the story and purpose of Tacitus’ “Agricola” in a Routledge collection entitled “Archaeology and Ancient History: Breaking the Boundaries”. She also had a paper on the Cipius Polybius skillets (inspired by her work on the Stormont Loch example from Perthshire) in the Roman Finds Group journal “Lucerna”, a review of Brewer’s “Roman Fortresses and their Legions” and a substantial review article on R.Lierke’s theories on ancient glass making, both in the “Journal of Roman Archaeology”. David, meanwhile published a paper on our revised chronology for the 1st century Roman invasion of Scotland in the “Hadrianic Society Bulletin”, an excavation report on work done at Silloth and Fingland Rigg, in a Feschrift honouring R.L.Bellhouse, and we had the usual short notes on our field work in “Britannia” and “DES”. The year has also seen quite a lot of work submitted for publication. The most significant was Birgitta’s book on the Roman fort of Cardean in Strathmore. This details our own work on the site, but centres around the late Prof Anne Robertson’s large scale excavations during the 1960s and 70s. The 600 page typescript went off in February and it should be published next year as a SAIR monograph. In addition, she has submitted a paper on the origin of the Roman Catafractarii cavalry units. David has submitted an excavation report on the Innerpeffray road cutting to “TAFAJ”, accompanied by Birgitta’s archive work on the site. He has also written a 30 page illustrated booklet on Roman Perthshire for our sponsors, the Perth & Kinross Heritage Trust, a technical paper on the wisdom (or otherwise) of using digital photography for primary archaeological recording for “Antiquity”, and a consolidated interim report on our first four seasons at East Coldoch for publication on the web. We have also continued to attract media interest. We made the front page of “The Scotsman” in February and an article about us appeared in “British Archaeology”. David was interviewed on the BBC news in October and later appeared in most of the Scottish papers talking about the increasingly serious damage being done to archaeological monuments by the burgeoning rabbit population. The year also saw repeats of some of our TV appearances, and Birgitta acted as an advisor to the “Time Team” on an excavation at the Roman fort of Drumlanrig. Finally, even Microsoft seem to have noticed our existence. The Project’s web site has been on the Encyclopaedia Britannica’s list of recommended sites for some years, but Microsoft’s competitor, “Encarta”, has now joined it by including a reference to the Gask frontier and, again, a link to our site. As ever, the Directors have continued to give lectures to a variety of academic, student and amateur bodies. Both gave papers to the annual Roman Army School at the University of Durham. Birgitta gave papers to the Institute of Field Archaeologists conference in Liverpool, to Perth “Doors Open Day” and to the Merseyside Archaeology Society, whilst David gave talks in Carlisle and Innerpeffray and, in Perth Museum, for “Perthshire Archaeology Week”. Sponsorship and Acknowledgements. The Project continues to be sponsored by the Perth & Kinross Heritage Trust, whose support has been indispensable and is very much appreciated. In 2004 the Trust funded our air photographic program, the purchase of additional air photographs and almost all of our specialist reports. They also funded the Innerpeffray excavation along with the production and publication of the report. In addition to this long term funding, we must also express our gratitude to three more bodies. The Roman Research Trust funded our work at Fendoch. The Roman Society funded the Drumquhassle survey, and our long standing corporate sponsor (which continues to insist on anonymity) has again provided material support, this year in the form of long loans on the new camera equipment already mentioned. Finally, the Project continues to owe thanks to the farmers and land owners who allowed us access to sites, to Dr David Simpson, who again provided medical services during our fieldwork, to Mark Hall of Perth Museum and to Peter Green who has continued to do a wonderful job of updating our web site. Tayside Aviation again let us play with their aeroplanes. Mrs Hillary Fuller spoilt us rotten whenever we flew. Andy and Eleanor Graham continued to provide us with dig accommodation and, as always, we are grateful to our many field volunteers, especially our long-standing trench supervisor, Keith Miller and geophysicists extraordinaire: Rachel Hunt and Susie Moore. The Future. 2005 will be another book year, with a contract from Tempus for the Directors to co-author an up to date account of Roman northern Scotland, under the working title “Rome’s First Frontier”. The book is to be submitted by year’s end and should be published in the spring of 2006. This will be quite an undertaking, so we are planning a slightly lower key field season. Nevertheless, we plan to be back at East Coldoch for yet another “final” season and we will also be conducting at least one more in our series of whole Roman fort and surroundings, geophysical surveys. We also hope to repeat our involvement in Perth Archaeology Week, although nothing has yet been planned. Certainly, this year’s dig at Innerpeffray proved a useful and enjoyable experience and there are a number of valuable pieces of work which could be done as similar short duration training exercises. Finally, our air photographic program will continue and, with luck, the gods of crop, soil and shadow marks will give us plenty of food for our shiny new cameras. Out of the field, the year will be dominated by books. The Tempus work will take the bulk of the time, but Birgitta’s slightly delayed book on the glass from Newstead is now almost ready and should be submitted shortly. Yet another book is also starting to rear its head. The original plan for our geophysical surveys was to publish them one at a time in PSAS, but we have now been offered a BAR volume on the forts in the north which will combine the survey reports with consolidated accounts of past work, including previously unpublished archive material, to produce a state of the art account. Publication is not scheduled for some years, but we need to stay on top of the individual survey reports as the work is done. In addition, there will be yet another consolidated interim report for East Coldoch, an account of the 1960’s excavation at the Caldhame Wood possible Roman road and Birgitta’s long awaited report on the Stormont Loch Trulla. Work has already begun on cataloguing 2004’s crop of air photographs and we hope to be able to improve public access to our growing aerial archive, which now contains well over 6,000 images. Finally, the Directors will continue to give public lectures wherever invited. Seven have already been booked, including (for the third year running) papers by both of us at the Roman Army School in Durham, and others will no doubt be scheduled as the year progresses. Directors: The Roman Gask Project. University of Liverpool.